Whether we realize it or not, we are constantly giving off body signals that affect how others perceive us. Body language is in fact so important that it is actually thought to account for almost 60% of our effectiveness in communication. This means that the success in which we convey our message is in fact more dependent on our body language than it is on our words. In a business context, body language can be considered a skill set that you would be wise to develop and refine. To some it comes naturally, but I'll bet the great communicators have spent their fair share of time in front of the mirror practicing hypothetical deliveries. With that in mind, this article takes a look at some of the obvious and not-so-obvious body language cues and movements and actions that the entrepreneur can practice up on. Pick one or two to work on this coming week in your meetings with clients and colleagues, and as you do, see if you can gauge the effect they are having on the other person. Perhaps you will get a sense of a higher level of trust or comfort coming back to you, which is often exactly what the master communicator is after. 1. Smile: Let’s start with an easy one: remember to smile, and make it genuine. Smiles are contagious, and studies show that going into a business discussion wearing one can help reduce the often high stress levels or tension that are part and parcel of the corporate world. Studies also show that a simple smile encourages those you are talking with to open up more quickly. And here are a few fun facts: according to research by the science journal PLOS ONE, smiling in the workplace can increase your chance of securing a promotion, and smiling in general makes you appear more intelligent to others. 2. Master the handshake: While you've probably heard about the power of a handshake countless times by now, it still has to be added to this list. A strong handshake goes a long way in how you are perceived– particularly by those who you are meeting for the first time. Many psychologists state that on average, we judge a person within seven seconds of meeting them, and according to the University of Iowa, a solid handshake is more important than our dress sense or personal appearance when it comes to how positively or negatively we are perceived. So how to do it right? As you would expect, avoid extremes. This means no vice-like grip, and no damp squib. Go for the firm, natural grasp, and ensure you make eye contact, as that is a display of respect and openness. 3. Posture and positioning: The obvious ones here include sitting up straight, shoulders high, and head held high, all of which helps convey professionalism. You'll also want to lean in slightly, which demonstrates that you are focused. Keeping arms and legs uncrossed lets others know that you are ready to listen. Finally, studies show that planting your feet firmly on the ground can help you feel more confident in your position in the conversation. 4. Mirroring: This is a favorite body language technique of great communicators. Mirroring is simply the act of playing a person’s own body language back to them. For example, watch for how they position themselves: if they lean in, do so too. If they gesticulate in a certain way, work in a similar gesture from time to time. It goes without saying that you don't want to make this look obvious. It's not something the other person should be aware that you are doing. Rather, it is something their subconscious will pick up on. And so what does mirroring achieve? Studies show it can lead to the other party being more open, which can lead to them revealing more information, making it useful in a negotiation setting. Studies have also shown that mirroring tends to foster a climate of collaboration and cooperation. 5. Keep your hands in check: Some of us are big on the hand movement without even realizing it. Others keep the hands firmly in check with little movement throughout discussions. Whatever your style, hand movement plays a big role in how you are perceived by others. Gesticulate too wildly and you will come across as being overbearing; keep your hands clasped and rigid and you give an impression of being nervous. Studies show that gesturing with your hands naturally while you speak will help improve your credibility, and there is also evidence that it actually improves your own thought process. Just keep in mind that when you are listening, it is best to keep your arms more still, by your sides rather than drawing them into or crossing them over the body. This gives off an air of openness and can even help you better absorb what's being said. So do a little mirror practice on this one and work it into your next conversation. 6. Perfect your gaze: So many people struggle here, but it's perhaps the single-most important thing a communicator can do. This is however not to suggest you should be holding perfect eye contact the entire time. In fact, you should be aiming to make eye contact for around two-thirds of the time that you are in conversation– more when listening, and less when speaking. The science behind it all reveals that any more than that and you actually come off as rude or that you are overtly attempting to display control or dominance; while any less makes you appear uneasy or even nervous. Another benefit of making the right amount of eye contact is that it helps us read the emotions of others and react to them accordingly. 7. Get the golden touch: Touch is the most primitive non-verbal method of communication that we possess, and using it at the right time and in the right way can help us get our message across far better than anything we say. Let’s go back to the handshake. A recent study by America’s Income Center showed that people are two times more likely to remember someone that they have shaken hands with versus someone they simply said hello to. 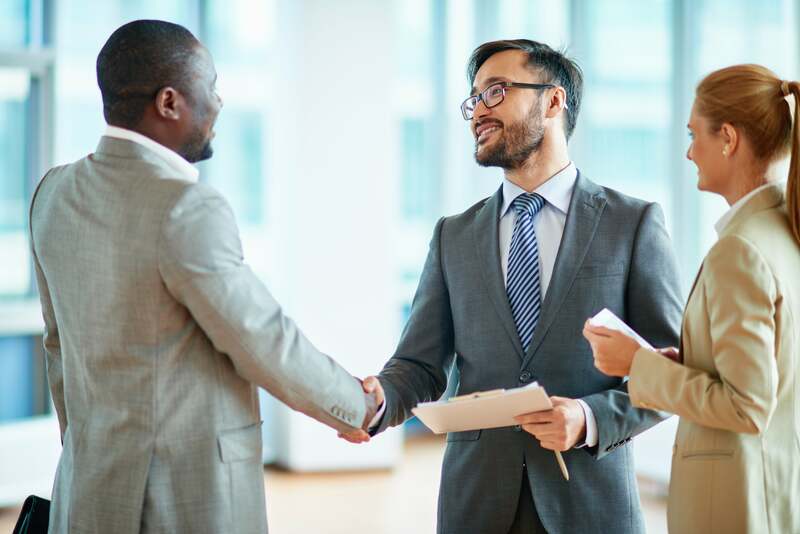 Handshakes aside, you can also use touch to your advantage throughout your conversation (where appropriate, of course, and always taking into account cultural considerations). One such tactic that many in the business world use is to lightly touch the arm of the person they are speaking to while saying their name. This very direct method of addressing the other person can evoke positive feelings and a sense of personal value. Now these touches should, of course, be natural and subtle, and they should be incredibly brief– in fact, it is thought that it only takes one-fortieth of a second to make a connection in this manner. The vast majority of body language cues are involuntary and subconscious. So while it is certainly worthwhile to try a few of these in your next business meeting, in general, the goal is to start becoming more aware of the types of messages your body can send without you realizing it, and also what the other person might be saying with their own subconscious movements and actions. As we have seen above, the body has the ability to reveal whether someone is listening, interested, to be trusted, and so on. In other words, for the astute body language expert, body language could end up playing a considerable role in influencing business outcomes.